Eclectic, up-and-coming 12th South neighborhood has a small-town feel within the big city of Nashville. The area began to develop into a business district when a streetcar line was built down Granny White Pike in the early 1900s. By the 1940’s, the area had become self-sufficient, including a gas station, church, and school system. A trend toward living in the suburbs essentially halted growth in the area during the 50’s through 70’s, but within the last 30 years local businesses and homeowners have put effort into reviving the area and creating a “new” 12th South District while preserving its historic nature. Today the streets are lined with Nashville favorites. Highlights include innovative popsicle flavors of Las Paletas, The Frothy Monkey funky coffee house, and Mafiaoza’s infamous Two-for-One Tuesday pizza and drink specials. Most homes are historic in nature, craftsman bungalows, tudors, cottages, and some four squares. 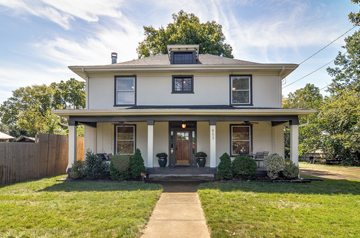 Recurring events include a free end-of-summer concert series in local Sevier Park and a historic Neighborhood Home Tour in the spring that opens the doors of homes that have been around since Granny White herself moved to Tennessee in the early 1900s. Learn more about the 12South Neighborhood and its Real Estate Market here.